If you’ve purchased my new book, Using Microsoft Visio 2010, or are contemplating purchasing it, you’ll be pleased to know that it comes with a free web edition. This allows you to not only watch the companion videos and listen to the audio snippets, but also conveniently access the entire book electronically, in full color! Not surprisingly, I think Using Microsoft Visio 2010 is full of fantastic content and at around $15 is a great value. The book offers over 400 pages of tips, tricks, techniques, practice and wisdom that will make you a power user. And it comes with 37 video files and 11 audio files that add an exciting dynamic dimension. One drawback of the lower price, however, is that the print edition is in black-and-white. Color printing, while becoming more commonplace everyday, still adds considerable cost to a publication. Luckily, the free web edition also offers full access to the book in spectacular color, along with in-place, one-click links to those media files. I enjoy perusing the book in all its vibrancy on my iPad 2, and find that it works wonderfully–and yes, the videos do play on the i-Pad! While getting to the Web Edition isn’t hard, there are hoops to jump through. 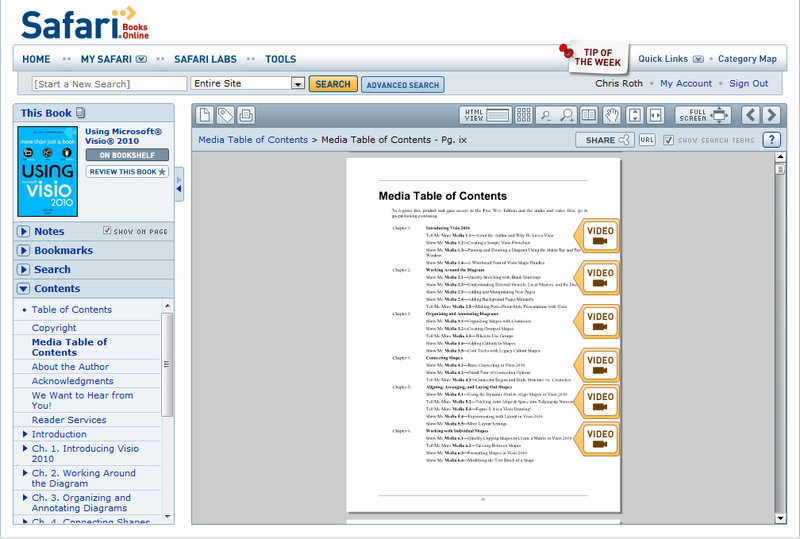 The key concept is to know that the content is hosted by Safari Books Online, not Que Publishing. You need a Safari Books Online account to get at the goodies, but never fear: if you have a Safari account already, you should be able to link this when you register your book, otherwise, a free account is created for you automatically when you register with Que. Once I an account with setup with Que, and the book was registered, I was able to go to my.safaribooksonline.com, sign in with those same account credentials, and get the online book plus media elements. 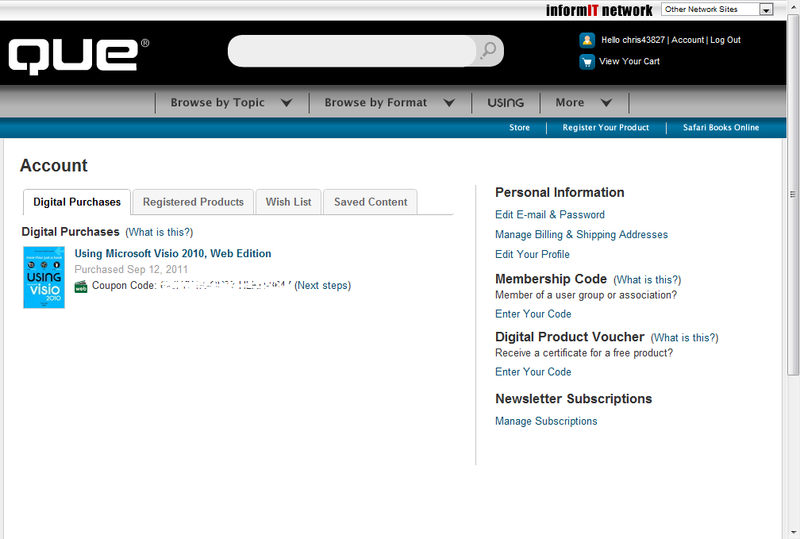 Let’s take a look at the process for registering and accessing the Web Edition of Using Microsoft Visi0 2010. On the back of the book, you’ll see near the bottom UNLOCK THE FREE WEB EDITION! 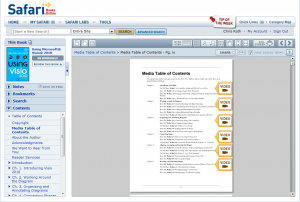 With subtext To register your USING book, visit quepublishing.com/using. Notice the big yellow button on the right, that entices you to Get access to the web edition, video tutorials + web + audio sidebars. The FAQ lots of helpful info, including what to do if you’ve purchased the Kindle Edition. After clicking the big yellow Register button, you are taken to a typical “create an account” page that asks for the usual tidbits, like name, e-mail address and password. After filling in this info and clicking a few check-boxes for something you haven’t read, but agree to, you’ll receive a nice e-mail from Que Publishing, entitled Que Publishing Account Creation. This asks you to verify your e-mail address by clicking a link. It also offers a summary of your account information, and possibly a limited-time coupon on other Que products. More bonuses! 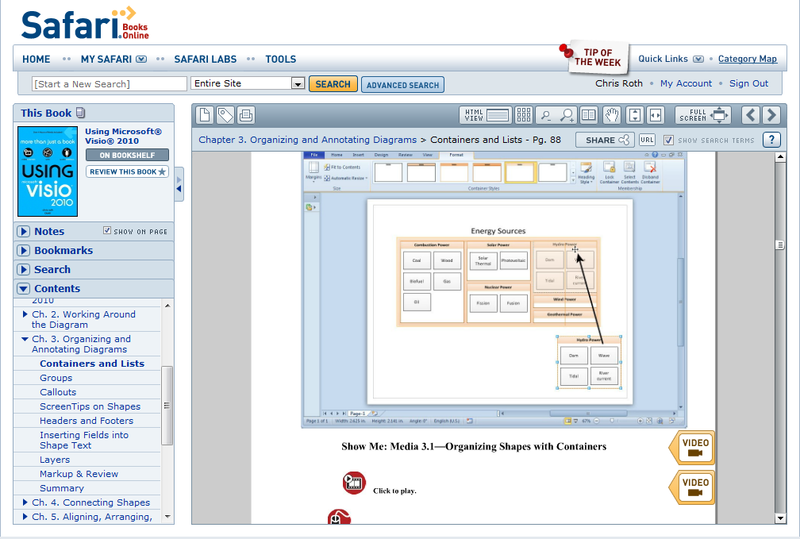 Clicking the link for Using Microsoft Visio 2010, Web Edition, takes you to Safari Books Online where you can log-in again, using your Que credentials. Click again and you get glorious on-line access to the book, the videos and the audio files. 4. Enjoy the Web Edition! Just look for the dark red circles that say Click to play. Voila! The video starts to play and you can relax your reading muscles for a few minutes! This no longer works. 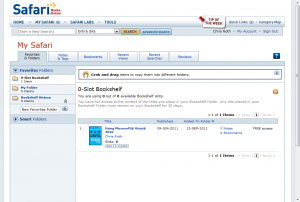 The site now requires that you enter a specific word from a specific page in the book. i bought the book how can i get the online edition? Not to be curt, but that is what this article is about. Was something unclear? And thanks for buying the book, I hope you’re enjoying it and finding it helpful! The online edition plus the video and audio content are intended as a bonus for purchasing either the paper or an e-version of the book, not as an alternative. Experts have to eat too! Hi, I brought this book mainly because I wanted to view the videos first. I do not yet own “Visio” but intend on looking at the videos and seeing what all the fuss is about and see if I want to buy and use this software package mainly as a hobby. I registered on line with Que ect. I keep getting this message after numerous tries to register the book. I did contact Customer Support and got an automatic email giving me an incident ref number and saying they would come back as soon as possible. But that was three days ago. There was a problem with with the answer you gave. Double check what you entered below. Note that answers are not case sensitive. If you are sure you entered the code properly, contact Customer Support. 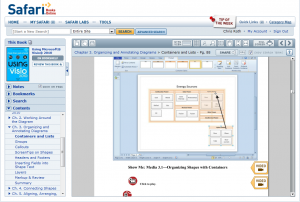 You’re in the process of registering the book: Using Microsoft Visio 2010. What is the first word of the third paragraph of Chapter 3? I think the idea of having online resources is a brilliant idea attached to a very reasonably priced book but what a pain in the @#S% to get to the resources over three days and still not achieved it. And still no response from support. Sorry I should have mentioned I brought the Kindle version. Just to double-check: the problem with the “first word of the third paragraph of Chapter 3”–I think that Kindle doesn’t show page numbers, just locations (like a status bar percentage) within a book? I might have unwittingly misled you again. I have the Kindle version but I have it on my desktop PC. So I can get colour ect. On the PC kindle reading software you can click on the contents button. It gives you front cover, about the author, index, Chapters ect. So I clicked on chapter three. It took me to the page of Chapter 3. “Organizing and Annotating Diagrams”. Then it is just a matter of counting down the paragraphs. Fool proof. Good idea but it just doesn’t work for me. I have had other questions to find second word in third paragraph……..But still with other questions it doesn’t work. And still no reply from support. I talked to my publisher and they know that there are problems. Hopefully they’re working on it. I’ve heard similar problems with the other Visio 2010 book, so it looks like this whole print-and-e-version stuff is still relatively new and buggy. Thank you, Chris for taking the time to get back to me. It would have been nice had support done so to. I brought the book mainly for the on line videos. I wanted to see how things are done and what can be achieved how easily ect. Ect. I have browsed through your book there is certainly a lot of content but I found it would have been a lot better for me if I had the software to follow along with what was being done. I can see you getting maybe some bad feedback through Amazon reviews ect for the issue of the online resources and it would be totally unfair to you and your book. But customers these days expect to get what they ordered and straight away without problems. In my case I think you have done all you can for me, the book looks great and hope I will one day soon be able to use it. To those who had problems confirming ownership with Que: I had the same problem but was able to get past it after acting on a hunch. When asked “What is the second word in the first paragraph of Chapter 9?” or a similar question, it seems that Que treats the real first paragraph as an introduction and ignores it. Simply use the requested word from the next (in this case the second) paragraph. This method worked right away for me. Thanks for the help, Cristian! I cannot get any access to the online content, despite much effort and time wasted on same. Like another writer, I wanted to see the videos – one of the main reasons for buying this book. Turned out to be a poor decision, because I’ve been completely unable to get to the web stuff at all. I followed the method outlined above (even found the second word in the para etc, thanks for the tip) so I have the book all nicely registered in Que. Well, a fat lot of good that does me, because I still cannot get into ‘Safari Books Online’ to see the web content! This article above says an account would be created for me – if it was, it certainly doesn’t work. Wrote to Safari ‘CustomerHelp’ (oxymoron) but the instructions they sent me are completely different from this one AND worst of all, includes demanding that I sign up for a PAID subscription with them and give them a credit card number etc etc before I am permitted to go any further. This is most certainly not the “free online access” to the web content I was promised and I feel distinctly cheated and misled. And seriously, trying to read the book without seeing it being done is frustrating in the extreme… Put me down as unhappy. Sorry to hear about your troubles. Since I wrote the book and created the videos, I don’t really have the need to use the online content, and am somewhat detached from that end of the business. As you can see above, I did find it a bit inconvenient to get to the online content, but that was months ago. I don’t know if anything’s changed. Were you able to get any kind of safari account created at all? Did it get junk-filtered per chance? Yes, yippee, it all finally worked!! I only just got an apologetic email from CustomerHelp telling me they’d sent me the wrong info first (possibly they overlooked the fact that I had a Kindle edition OR possibly my fault in that I perhaps didn’t mention it) and sending me a completely different set of instructions and a link I’d never seen before… it still didn’t work 100% as set out, but to cut a long story short, I’m in, it’s working and I’ve just got to look at the first video. It’s been a convoluted process, but past it finally, thank heavens. And thanks for you reply. I enjoyed your videos with Microsoft so much, you see (learned a whole bunch of things I hadn’t known about Visio before in a few) that I was annoyed about missing out on them. Not the case any longer. PS I’m using the ‘randomise shapes’ fun thing that I downloaded from your blog/site/wherever. Very cute – I enjoy the individual and hand-drawn look to them, which is a nice way to highligh/emphasise ‘we’re really only just starting to work on this thing here’. Thanks a lot for making that available too. Super news, Jane! Thanks for letting us know. 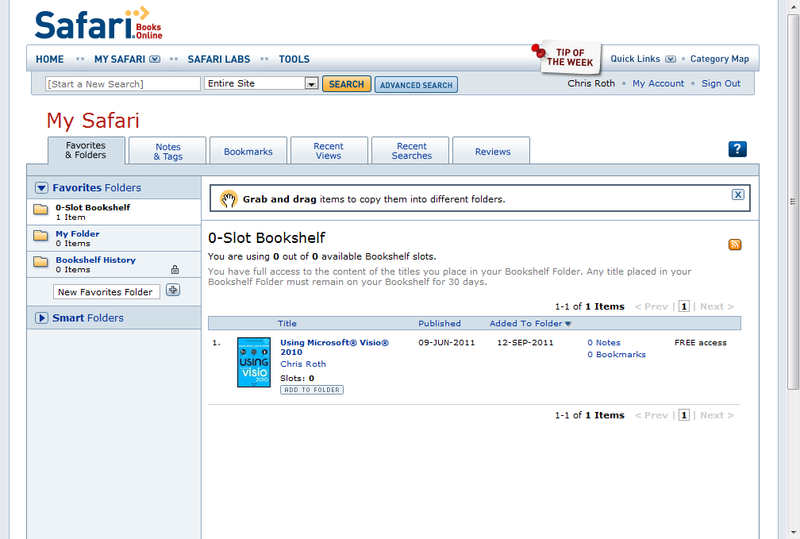 I agree the process to get the “online book” is too convoluted. I can understand two different companies trying to partner, add a pinch of security and a dash of bureaucracy, and things get complicated for the poor developers rather quickly. I guess the internet is still a bit young and wild. But customers shouldn’t have to think about any of that, I suppose. Exactly so. I suspect if you or I drew up their process the weaknesses would be apparent just from the draft – one of the great strengths of doing processes in something like Visio. My experience was that it felt a bit like some of those I do with clients to help them get their processes clearer: lots of little arrows flying back and forth in many directions, often going through what I represent as a cloud with ‘something happens here, but blowed if I know what/how) written on it. But again, thanks for your concern. I’m enjoying the online content. I am unhappy at the moment. I have bought the Kindle-Edition of your book(amazon.de). That worked fine. Then I tried to register at QUE but that didn’t work. I sent an email to the customerservice and wait for an answer now. When I tried to download it to my android tablet . The Kindle App don’t like your book. The only place were it works is on my pc. Tut mir leid wegen des Frusts. I don’t really know much about the sales logistics of the book. I did try out the registration process, and found that it was not very easy, which is why I wrote this article. But I imagine the process has changed by now and I don’t really know what to tell customers. I put all of my energy into writing the book and creating the videos, but I have nothing to do with the distribution of the product, and can’t really help. In my monthly statements, there are sales of a Safari PDF version of the book. I wonder if you could return/get refunded for the Kindle edition, then buy the Safari PDF and read that on whichever device you like? Wolfgang, persist, because it DOES work on the Kindle – it just takes a while to get it sorted. The process isn’t simple at all, and seems to depend upon 1. persistence and 2. getting hold of the right person in Que customerservice. I agree it’s frustrating, but I did manage to get it working. I could resolve the problem. I have reinstalled the Kindle app and now it works. The other problem was confirming the book ownership at QUE. It asked for the first word of the second paragraph in chapter 5. When I typed that word I got an error. Then I tried the first word of the third paragraph and that was correct. So it seems that the program starts counting at ZERO instead of ONE. Glad to hear that you got it working, Wolfgang! I think a lot of people are buying e-versions, so this is really, really good information! 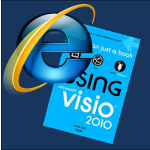 Excellent book and I enjoy the Visio 2010 MVP video session with your fellow MVPs. Unfortunately, I have the same issues obtaining access to Safari Books Online as previously described by Jane Bennett but was not fortunate to obtain resolution. 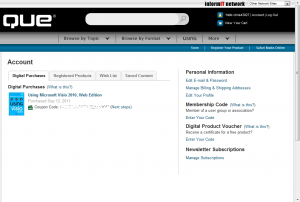 Creating the Que login – no problem, it’s the Safari site that does not recognize my credentials. I emailed both Que and Safari over a week ago, no answer. Sorry to hear about your travails. This really bothers me, since I’m pretty much powerless to do anything. I went back and looked at my test account information. I found the old “welcome to Safari” e-mail. Did you get one of these? When I tried my e-mail and password, it didn’t work. So I tried the “forgot password” option on the log-in screen. After ten minutes, I got the “go here to reset your password” e-mail from Safari. I did that, and then I was able to log in. I was required to enter a word from chapter 9 , which I did but still unable to register. This book was purchased because of my need to get some project done last night. Why make it so hard to do this. Did you try Cristian’s advice from above? (16th comment before this one) He had a similar problem, but figured it out, and it has helped others. I didn’t create the registration process and it’s too bad that some have had difficulties, but I’m pretty sure the book isn’t useless. I was able to get this working just now — instead of looking at the 2nd word in the 1st Paragraph of Chapter 9 I used the 2nd word in the **2nd Paragraph** and it worked. I wrote the book under contract with QUE Publishing. Unfortunately they have made getting the online materials difficult in many circumstances. But please understand, I have no control over what the publisher does. It’s frustrating to hear customers’ problems, but unfortunately these issues are really out of my hands. Like Donnamarie above, I also cannot get the videos to work, and I also only belong to Safari for your book. Like so many others above it took several days to get the online access working. I tried the videos on the first day, when they didn’t work I called the help line. The representative said they don’t work on her computer either and she would put in a trouble ticket, and to expect it to take a long time to get it fixed. It has been 15 days and they still don’t work so I decided to come check your site and see if anyone, or everyone, else is having the same problem. I was hoping to find a solution posted. Perhaps it is the version of IE I am using? Does it work with other browsers? If so I can put in a ticket for my IT department to install a different browser. If anyone has found a solution to this please post it! I understand that you have no control over the publisher, but I thought you would want to be aware of this. I just found a work around. I called Safari support and was told they are working the problem but it is fairly complex so is taking longer than they would like to fix. However there is a work around, all the videos are available on Safari as a separate item. Just search for “Using Microsoft Visio 2010”, you will get results on two tabs, “Books” and “Videos”. 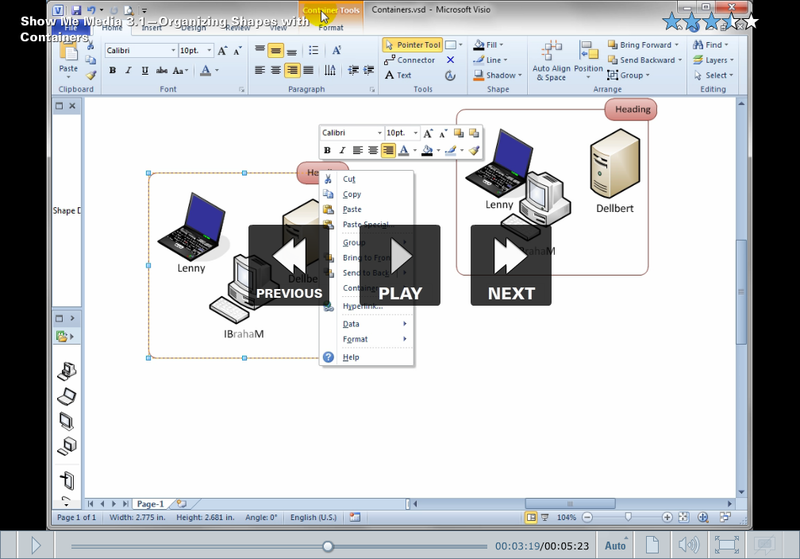 Click the Videos tab and the first result is the video file for “Using Microsoft Visio 2010”. Add this to your favorites, then go to your favorites and click the title. 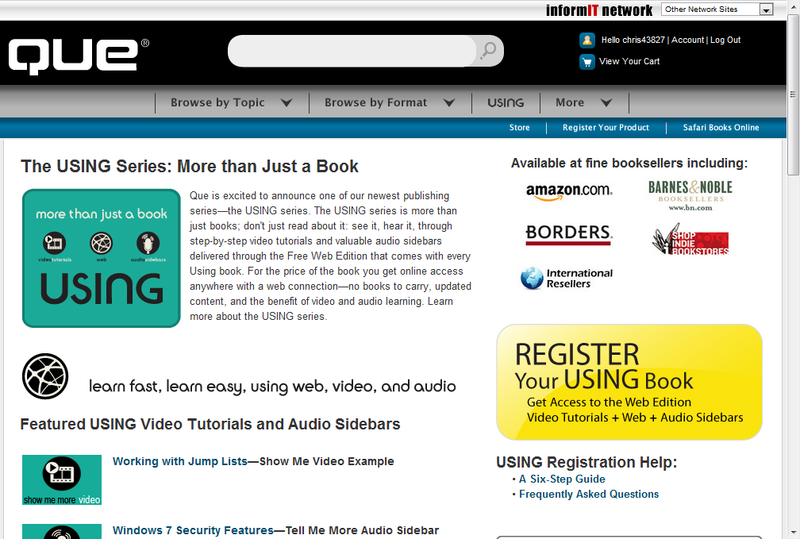 A video viewer opens, if you scroll down below the viewer there is a table of contents with all the videos listed. Simply click the video you want to play. When you read the book you can have two tabs open, one for the book and one for the videos. Not as convenient as having links in the text, but at least we can watch the videos! I hope this saves someone the trouble I went through. Thanks so much for chasing down the work-around and posting here. I really can’t afford the time right now to do this, so it’s really wonderful of you to help out! Hope this works for the other readers out there that are suffering! Pretty great post. I just stumbled upon your weblog and wished to mention that I’ve really loved browsing your blog posts. After all I will be subscribing for your rss feed and I hope you write again very soon!